The IGS has created a new project called MGEX to gather and process multi-GNSS data. IGS MGEX stands for Multi GNSS Experiment and it was proposed and is managed by the IGS GNSS Working Group. The main aim is to collect GNSS data containing more than GPS+GLONASS data. Currently there are a multitude of modern receivers that provide data for GPS, Glonass, Galileo, QZSS, SBAS and even possibly Compass. The number of participating stations has been increasing over time. Below a plot of a recent day of data files available . 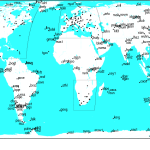 These are stations mainly contributing data in Rinex 3 format and some in Rinex 2. 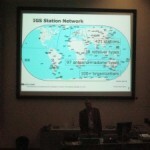 Some of these stations are already existing IGS stations. At ESA/ESOC we are staying well informed of the developments in this IGS project through the participation in the IGS GNSS Working Group. ESA/ESOC hopes to be able to contribute to MGEX with data and analysis results. ESA/ESOC is upgrading its station network (see figure below) during 2012/2013 to full GNSS capabilities with new Septentrio PolarRx4 receivers and Septentrio Choke Ring MC Antennas. This entry was posted on Monday, July 9th, 2012 at 12:27 and is filed under Uncategorized. You can follow any responses to this entry through the RSS 2.0 feed. You can leave a response, or trackback from your own site.